Just a quick update on a small side project that I recently completed. It started out as a test driven development code kata which involved implementing the classic shunting-yard algorithm by Edsger Dijkstra as well as a basic RPN evaluator. Additions to the basic algorithms includes support for named variables, a constants, and conversion of infix expressions to rpn. The end result is a simple calculator for the windows desktop, written in WPF/C# for the .NET 4 platform, which allows you to input complete mathematical expressions in either infix or postfix (rpn) notation. It is designed to be easy to use by minimizing the use of settings and mode toggles. It will for example automatically detect if what you have entered is in infix or postfix notation. Calcium, a simple infix and rpn calculator. As with all my utility side project the main goal was to create something that I would like to use myself. I have annoyed myself at the built in desktop calculator for some time while other more able calculators I have tried have seemed like overkill for my needs. conviction that unit tests are indispensible for maintaining code quality and correctness. Note: As is always the case with experimental software such as this I give no guarantee that it will always perform correctly (so please don’t use it for anything critical). If you discover that the calculator returns something unexpected or plain wrong then don’t hesitate to leave me a comment to tell me about it. As is the tradition for me I got some for-fun coding done during the Christmas holiday. While playing Minecraft with my 7 year old son we discussed how it is actually possible for a single person to make a game (which got him excited). I therefore decided to follow this up with some game making of my own (the offspring helped out with play testing when I could drag them away from Minecraft). I took some old collision detection code I had experimented with before and proceeded to turn it into a game. Getting into playable condition was quite fast. Polishing it up and play testing it took a while longer which is why I’m presenting it here in February. As I currently work on projects involving Windows Azure I decided to add an online scoreboard which you will find here: http://chainpop.azurewebsites.net. You can also download the game directly here. The scoreboard is an extremely simple Web Application / REST(ish) api built with NancyFx. Scores are stored in and retrieved from an Azure Table Storage table and the nancy module serving as an entry point is all of two dozen lines long (see below). 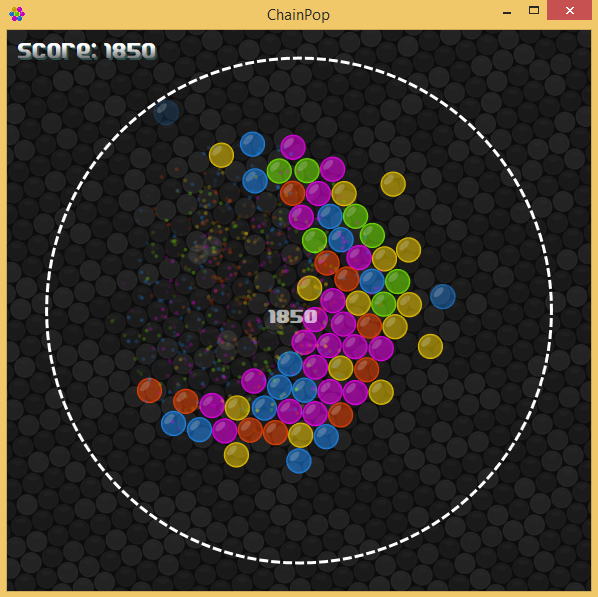 Note that ChainPop is a WPF application and requires .NET Framework 4 to run. Try it out and tell me what you think. More is sure to follow. 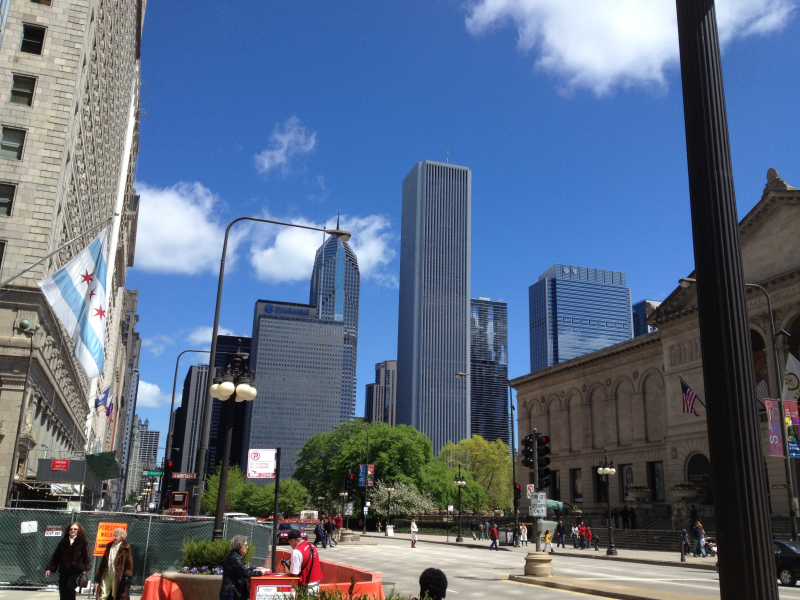 The day 1 keynote at Visual Studio Live in Chicago is titled “Visual Studio, .NET and the Cloud” and was delivered by Jay Schmelzer (Director of Program Management for the Visual Studio Team at Microsoft). Heavy emphasis was put on development with Visual Studio Lightswitch, Sharepoint and Office 365. Visual Studio Lightswitch is an interesting solution for those plain vanilla business applications that really don’t benefit from a fully custom approach. Why reinvent the wheel by constantly writing the same old validation code for things like phone and social security numbers? At the same time the developer community seems to be almost universally skeptic as to whether it is actually a good idea. There are a number of reasons for this. Some developers are dismissive of the notion that we will ever be able to create complex business applications without writing code. Yet others object to the notion that non-technical people will be able to use the tool. It may not be development but is still quite complex. Regardless of the possible objections I think this is an interesting option which might become popular for those business applications that don’t really need to follow a custom design or have much in the way of really complex business logic. In short, even though the idea of developing in Visual Studio Lightswitch doesn’t exactly fill me with warm and fuzzy feelings, I do see a business case here. If you have a different opinion please don’t hesitate to comment. 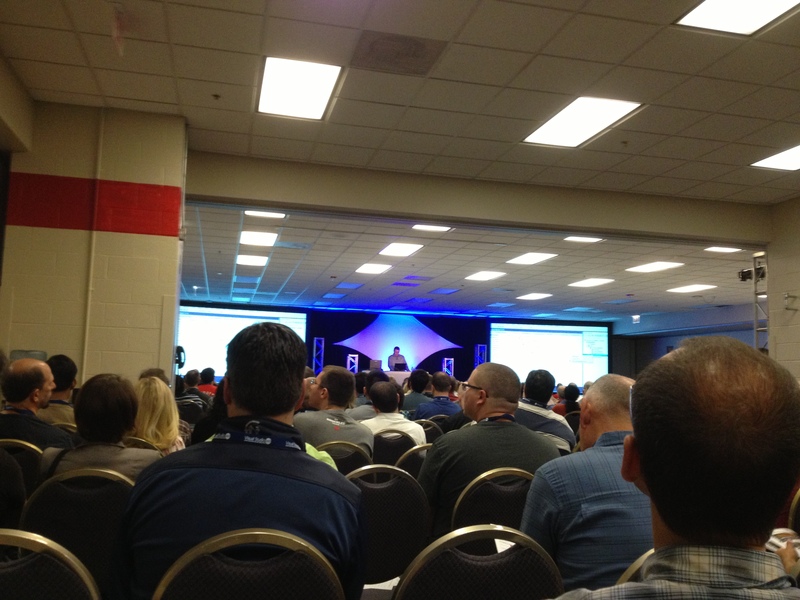 I am currently at the Visual Studio Live conference in Chicago attempting to absorb all the information I can on subjects as diverse as Windows 8 application development, Windows Azure, and Node.js. Given that this conference is not arranged by Microsoft, the discussion turns out to be quite candid and open. Windows 8 represents a significant change and is in many areas (such as touch and tablet computing support) clearly an improvement. It is obvious however that the right-brain, left-brain split between the “Metro” and the Desktop sides has caused significant confusion in the developer community. Pushing pixels with the HTML5 canvas. My experimental application is a cosine interpolation between points on a grid “overlaying” pixels of the canvas. The interpolated elevation is translated into a color by interpolating between three colors. It is worth noting that this code was written for readability and understanding rather than with performance in mind. I have posted the source to GitHub and you may directly preview the page here. The goal I set myself was to get the demo up and running even in full screen with reasonable performance. 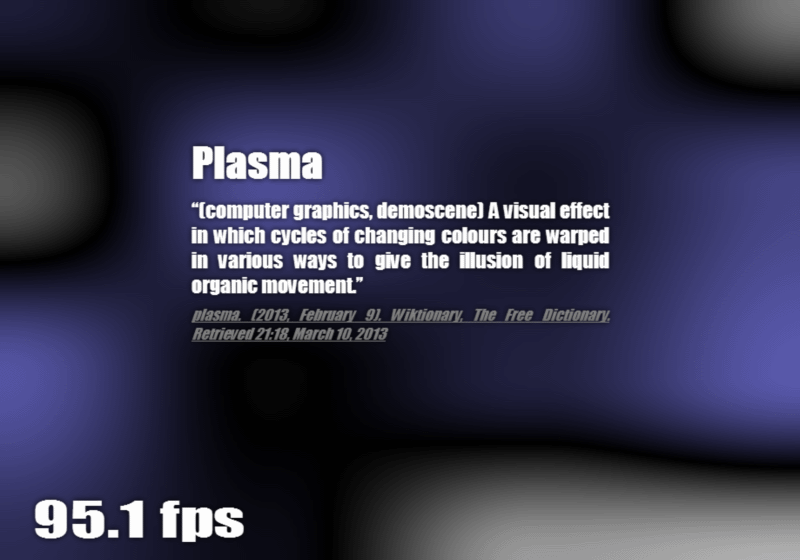 To this end I decided to render the plasma to a smaller canvas off screen and then paste it to the larger canvas for each frame. To do so requires a rather elaborate setup. // Set up our rendering canvas, context and image data. // Retrieving our target canvas, and context. // Scale between the render and target canvas sizes. each frame onto the target canvas in the render loop. // Write image data to render canvas. // Draw render canvas onto the target canvas. To keep it all straight in my head I decided that a few helper “classes” were necessary. The most central of them is the one dealing with the grid data and its animation. The others are a simple color class for interpolation and a grid point holding a value and an animation direction (up or down). The interpolation over the grid onto the canvas pixel data is encapsulated in the following functions. A nice writeup on cosine interpolation may be found here. // points in unit coordinates (0-1). // quadrant that this point belongs to. // Unit coordinate within grid. // top, left, bottom, and right. Notable observations which I have taken from this experience is that Google Chrome basically wipes the floor with IE9/10 in terms of framerate. Using Google Chrome on my Apple MacBook Pro (Late 2011) I get 90+ frames per second in full screen running this, while IE barely reaches 15 frames per second. The performance seems to vary considerably depending on hardware as running it on my work machine (Lenovo T410S) results in more flickering and lower frame rates. In summary this was an extremely fun little side project and I am sure to be continuing to experiment with the HTML5 canvas in the future. This is a quick update on my earlier post where I have included orbBasic code for the Orbotix Sphero which will give it some rudimentary autonomy. Observe that the code comments below should not be sent to the Sphero. I am currently working on creating a more user friendly tool for loading basic into the sphero. The undocumented command line tool included in the embryonic framework from my previous post will read an orbBasic file, strip the comments, and transfer it to the Sphero. However, since I only posted source code you will need Visual Studio to compile and run it.
' or until we hit something.
' (+/- 15 degrees) and continue.
' Lets take it from the top. Wired UK recently ran a very interesting article about moving mesh cosmology. In a recent simulation of galaxy formation, billions of points of mass slowly acreate to form stars and galaxies, continuing their cosmic dance for some 14 billion simulated years. The software used to create this marvel is called Arepo (created by Dr. Volker Springel) and utilizes Voronoi tesselation. One end result is the truly stunning animation below (the animation covers a “mere” 9 billion years). I installed the latest release candidate of Raspbmc (RC4) on my Raspberry Pi during the weekend and have been enjoying flawless video playback ever since. Installation, as seems usual with the Raspberry Pi (and highly unusual for most Linux flavors), was a breeze. Just download the installer for your OS and follow the instructions on the site. The installer downloads a minimal OS image and writes it to the selected SD card. The next step is simply to insert the card into the Raspberry Pi and power it on. At which point it will proceed to download and install the rest of the system directly from a Raspbmc download server (the Pi obviously needs to be connected to the internet at this point). The most arduous part was making a cup of coffe to enjoy while this was going on (which took about 25 minutes). 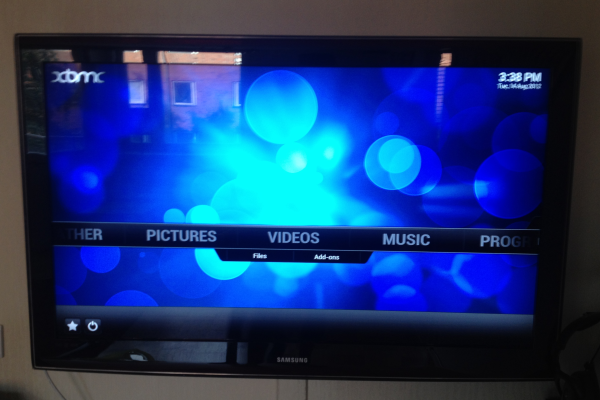 Raspbmc in action (UI after startup). 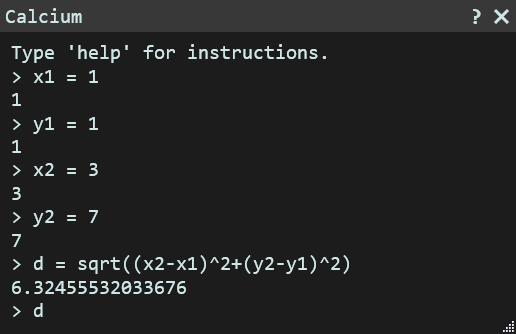 This new RC is based on Raspbian and has support for floating point calculations in hardware. Even though video playback was ok in RC3, UI interaction would become sluggish while playing video. Thankfully this is no longer an issue. Assigning the Raspberry Pi to media center duty has the added benefit of no longer having to put up with the power guzzling and jet engine sound level of the Xbox360. In contrast the Raspberry Pi runs perfectly silent from a 5 volt generic cell phone charger (at 700 mA). Thinking for a while about where to place it I finally decided to just dump it into the cable mess behind the TV bench. It is so tiny it is hardly noticed there anyway (even cased). Interaction is via a wireless keyboard and mouse for the moment, although I might investigate the possibility of hooking it up to our remote. I highly recommend the Logitech Wireless Combo MK260 (check out this site for a list of verified peripherals). In short, for those of you interested in a low-cost media center computer, choosing the Raspberry Pi is a no-brainer.